The robotic workcells will be integrated with existing warehouse material handling systems, such as those from Lightning Pick, and will increase the level of automation. 07/25/18, 05:40 AM | Industrial Robotics, Factory Automation | BitFlow, INC. 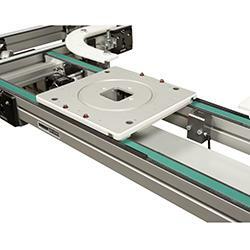 Rapid adoption of the CoaXPress (CXP) machine vision standard has opened up applications that go beyond the confines of the factory floor and into a variety of emerging market segments ranging from agriculture to medical science. 07/24/18, 06:19 AM | Industrial Robotics, Factory Automation | Dorner Mfg. Corp.
New Creo View format reader and new CAD formats versions supported. 07/20/18, 08:10 AM | Industrial Robotics, Factory Automation | Electromate Inc. The VP Series Performance Plus miniature spiral bevel gearboxes pack high performance in a small package with the highest torque density, range of ratios, and torque capacity on the market. Automotive and appliance suppliers use In.advance™ software from Tend to reduce unforeseen robot failures by up to 60%. U.S. manufacturers could save $58+ Billion in downtime costs per year. 07/18/18, 09:24 AM | Industrial Robotics, Factory Automation | ABB Inc.
New solution combines state-of-the-art hardware with ABB Ability™ digital offering to achieve breakthrough paint performance.